Students perform their award-winning poem, "The Life that is Worthy." Their message makes them ambassadors of sustainable development, said leaders at the 2016 Music, Dance and Drama Festival. 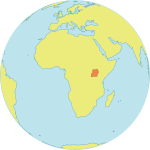 KAMPALA, Uganda – Talking about sexual and reproductive health is not easy, especially in the conservative corners of Uganda. But the girls of Buddo Secondary School found a powerful way to address the issue: poetry. “Plan your family to fend off poverty / To enhance your savings / To feed with quality / To take your children / To schools of quality,” they recited at the launch of a youth festival that drew thousands of students from across the country. 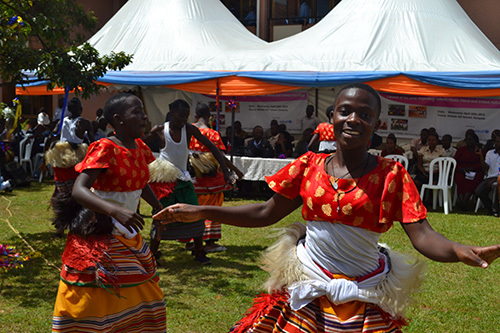 The Music, Dance and Drama Festival is an annual arts competition, where students showcase traditional dances, songs, poetry and speeches at events held all over Uganda. 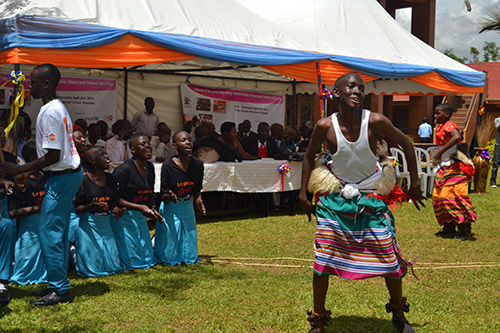 This year’s festival focused on empowering youth to help Uganda achieve its development goals. UNFPA, which supported the festival, introduced teenage pregnancy and child marriage as additional themes to cover through the arts. Helping girls finish school, find decent work and fulfil their potential are key ways to help whole communities and countries rise out of poverty. In this way, the girls’ message makes them ambassadors not just of Uganda’s development, but of the global Sustainable Development Goals (SDGs), which aim to eliminate poverty everywhere, said Esperance Fundira, then the UNFPA Representative for Uganda. Teenage pregnancy rates are staggeringly high in Uganda. According to the country’s 2011 demographic and health survey , nearly a quarter of girls aged 15 to 19 have had a baby or are pregnant. Many drop out as a result; secondary school enrolment rates are lower among girls than boys. “Many young girls find themselves in difficult situations because of the lack of information,” said Charles Seruyange, a music teacher at Buddo Secondary School, in the central district of Wakiso. “It is important for the schools to step in and give this knowledge,” said Jane Nabakka, another Buddo music teacher. The students from Buddo are working to spread this information to other students. “Empower the girl / To read to the end / A child cannot be a mother to a child,” they said in their poem, which won a top award at last year’s festival. The school went on to win top marks at this year’s competition as well. In the lead-up to the festival, the Ministry of Education and UNFPA trained over 100 teachers on the issue of teenage pregnancy, including factors such as child marriage, and solutions such as access to age-appropriate information and sexual and reproductive health care. The teachers discussed the impact of pregnancy on individual girls and on the country’s socio-economic development. They also learned about communicating these messages through traditional folk songs, folk dance, plays, poems, speeches and other art forms. These 100 teachers in turn conducted teacher trainings at the regional level. The teachers then worked with students to incorporate this information into music, art and dramas for the annual festival. UNFPA is currently working with the Ministry of Education and the National Curriculum Development Centre to bring culturally acceptable and age-appropriate comprehensive sexuality education to schools.